Being host to Christmas and New Years Eve, December is an infamously busy month for everyone’s social calendar. The phrase “we should catch up before Christmas” gets mentioned increasingly frequently between friends, family, ex-work colleagues and that one person you went to school with and happened to bump into who insisted on ‘getting the gang back together’ before 2014 comes to a close. December is also a busy month for new Sydney hot-spots, so we figure you may as well check them out at one of your many social engagements (or just with a partner in crime at any time). The Macquarie Hotel in Surry Hills has a new look, a little more Latin and a whole lot more cool, with two new places to eat and a revamped public bar. Paul Wilson from Icebergs, Bar de The and Salon de The is casting his magic over the kitchen with a strong Latin theme. The ground floor public bar ‘Harpoon Harry Barbacoa’ will offer Sydney-siders a taste of original Latin barbeque, available in true street-food style via a street-side window or ordering at the bar with some guacamole to tide you over before the feasting begins. Upstairs will be ‘Paladar Dining Room’, showcasing the full scale of Latin food from Aztec to Spanish, featuring a ceviche bar and a feasting menu offering spit-roast suckling pig. Along with Cuban inspired cocktails, it’s hard to know where to start at this new Latin hot spot, so we guess you’ll just have to find a second stomach or clear your diary for multiple sessions at Hotel Harry. Our simple instructions for checking out Bondi’s Mr Moustache is to go for the food and stay for the cocktail menu. They keep their tostadas and tacos simple, using fewer and fresher ingredients which is a delicious approach. If you like to think of yourself as a Mexican aficionado, head straight for the list of Mexican beers with matching taco recommendations. Mike Tomasic is the winner of the Global Angostura Cocktail competition and also the mastermind behind the cocktail menu, which does spectacular things with mezcal, pisco and tequila. Sydney is now overflowing with cool restaurants to get your Mexican fix, but Mr Moustache, with its cocktails and more authentic Mexican approach, is a one of the best on the scene. Australia’s Godfather of Italian cuisine, Stefano Manfredi is joining the ranks of Sokyo and Momofuku Seibo at The Star and opening Pizzaperta. The open-air piazza style pizzeria and bar will offer emerging ‘new wave’ trends of the humble Italian street food, Italian-infused cocktails and a unique wine list. The pizza menu has all the classics while the more seasonal menu offers interesting and mouth-watering options like artichoke, buffalo ricotta and fennel sausage and lamb belly with ricotta and Mediterranean herbs. Wash it all down with a ‘Holiday In Naples’ which is a rustic blend of cranberries, pomegranate and lemons matched with peppercorn & rosemary infused Ketel 1 vodka, an Italian aperitif Punt es Mes or perhaps a quintessentially Italian Aperol Spritz. The daughter of French Michelin Chef Gerard Garrigues, Julie Garrigues has launched her first restaurant, French Touch Creperie in bustling Crown Street, Surry Hills. After spending time in France training to become ‘Maitre-Crepier’ (or Crepe Master to us simpler folk), Garrigues is introducing us to a wide variety of gourmet crepes, both sweet and savoury. The use of buckwheat as a base is not only healthy and delicious, but also gluten free! Some of the sophisticated combinations include ratatouille and chorizo, caramelised onion stew, and duck breast with homemade peach chutney. An open kitchen set in a rustic French country interior lets you watch the crepes being made. Fun, French, delicious? We’re convinced! For North-side dwellers who are sick of having to cross the bridge for some hip and delicious food, all hail The Greens in North Sydney! What used to be Norths Bowlo has been transformed by husband-and-wife team Nathan and Lily Fasan, who are both formerly of The Grounds of Alexandria. They’re bringing quality food, summery cocktails and a veggie garden to North Sydney, and with some of the best views of Sydney Harbour, this is sure to be a summer favorite. The cocktail list is fresh, zesty and perfect for summer with a large list of cocktails to share. Food-wise, there are interesting share plates to start, like oxtail croquettes and crumbed bone marrow, before moving on to something more substantial like the barman’s plate for two with terrine, cured meats, scotch egg, house pickles and other delicious bounties or the lamb neck cooked in pastry with smoked carrot, yoghurt and garden peas. Whatever you choose, The Greens is the perfect summer destination to share some food, some cocktails and the beautiful view of Sydney Harbour. Winners all ‘round! 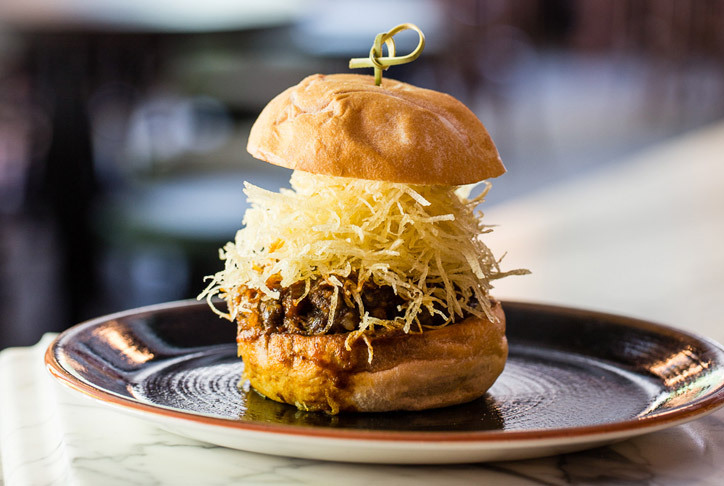 The Chur Burger pop-ups at The London Hotel in Paddington and Manly Wharf Hotel will always have a place in our heart, but we’re pretty excited at Burger Liquor Lobster taking its place. Perfectly summery with a cheeky seaside and nautical vibe, this is going to be the top spot to get your lobster fix, the lobster roll is deliciously affordable; a crusty roll filled with salt and pepper lobster, lemon aioli, chives, red onion and iceberg lettuce only setting you back $15. A price-tag like that means a bigger cocktail budget, and they definitely have you covered; try ‘My Tini Wini’ which is sure to be fruity and delicious or perhaps the Rock Lobster. If seafood isn’t your thing, there is also a range of beef, chicken, pulled pork and lamb burgers, as well as a vege burger which is a delicious morsel with kale and beetroot yoghurt. Whether you go for the seafood or burger, Burger Liquor Lobster is sure to be a Sydney summer favorite. I Scream Nails is a super cool and bright nail art salon that started out as a pop-up in Melbourne before opening their first salon in Melbourne and finally bringing their fun, youthful approach to nail art to Sydney. They specialise in events and pop-ups and are especially good for hens nights, birthdays, corporate and in-store events. Made up of a team of over 20 nail artists, they are 100% skill and talent, no stickers to be seen here. With all your upcoming social events and all these great new Sydney bars and restaurants to check out, get yourself to I Scream Nails in Newtown to get your nails feeling as festive as you are. If we were to describe Assamm in three words, they would be different, delicious and spicy. This cool new CBD Thai takes influences from all around Asia, offering their own version of ramen, Chinese style pork dishes and spicy stir fries. If you’re a fan of things that pack a punch with some Asian inspiration, make your next dinner date at Assamm. Plus, they conveniently take bookings so no waitlist for you! Double Bay is definitely starting to grab our attention as a burgeoning foodie hub, and the opening of Pink Salt is certainly contributing to that. Leading the way in the kitchen is Mark Williamson who has a history with The Botanist, Bondi Hardware and The Tilbury so you know the food will be fresh, fuss-free and perfect for sharing. Entering through the atrium and glass ceiling, the recycled timber and industrial finishes along with the brass and bronze fittings create a lovely atmosphere to settle in with their extensive drinks list. The kitchen stays serving bar snacks and small share plates as part of a supper menu until 1:30am, so you’re covered for late night eating options in Sydney (that don’t consist of pies or kebabs). Starting in Los Angeles, Meat District Co. creates a blend of old school and contemporary style with a focus on ‘Paddock to Plate’ eating and they’ve decided to open up another venue in Australia, lucky us! Bringing the LA cool to King Street Wharf, the extensive menu ranges from burgers and ribs to truffle mash and grilled artichoke. With lengthy wine list and a range of beers on offer, you can very easily spend a few hours lounging back and enjoying the summer sun.